How to: carry a Kayak on your 4-door Jeep Wrangler JK. Now that Spring has officially sprung in NY, it’s time to get out in my new kayak. I also happen to drive a 2007 Jeep Wrangler Unlimited with a Hard Top and don’t live right on a body of water, which means I’ll need to find a way to carry my new kayak on my Jeep. There are a few standard questions involved with outfitting your Jeep JK with a Kayak Carrier. If you have an original equipment hard top, it will come with rain gutters (the small lip over both doors), but no built in roof rack or cross rails. Step #1: Footers (the piece that attaches directly to the hard top. In this case to the rain gutters) and Cross Rails. The Thule 300 + 58″ Load Bars are the best option for a 4-Door JK with a hardtop. This base rack set-up will be what you attach your kayak carrier to. Step #2: The Kayak Carrier. We recommend one of the following Jeep Wrangler Kayak Racks depending on what type of kayak you own and your own personal preference. The Hull-A-Port 835XTR features a J-Cradle with a wide mouth to hold your kayak at an angle on your roof. Thule’s Glide and Set 883 is perfect for longer, wider kayaks with large, wide, adjustable saddles. The 830 Stacker will hold your kayak on it’s side and folds flat when not in use. Step #3: Load Straps. It’s also a good idea to use straps or ropes attached from the front and rear of your kayak to your front and rear bumper for extra stability. Step #4: Get out there and have fun! As I sit here in our office, sweating my way through record breaking heat, my mind has been drifting off to thoughts of kayaking on the lake. Many of you must have been thinking the same thing lately, as you’ve been asking us a lot of questions on how to carry a kayak or canoe on your Jeeps. It’s actually easier than you might think. On any Jeep that’s not a Wrangler, you’ll require some type of cross rails and the rack to attach your boat to those cross rails. To carry a kayak or canoe on your Jeep Patriot, we’d recommend the Mopar Sport Utility Bars. These hardy cross rails are designed to hold more weight than your average factory bars and can easily handle your canoe or kayak. 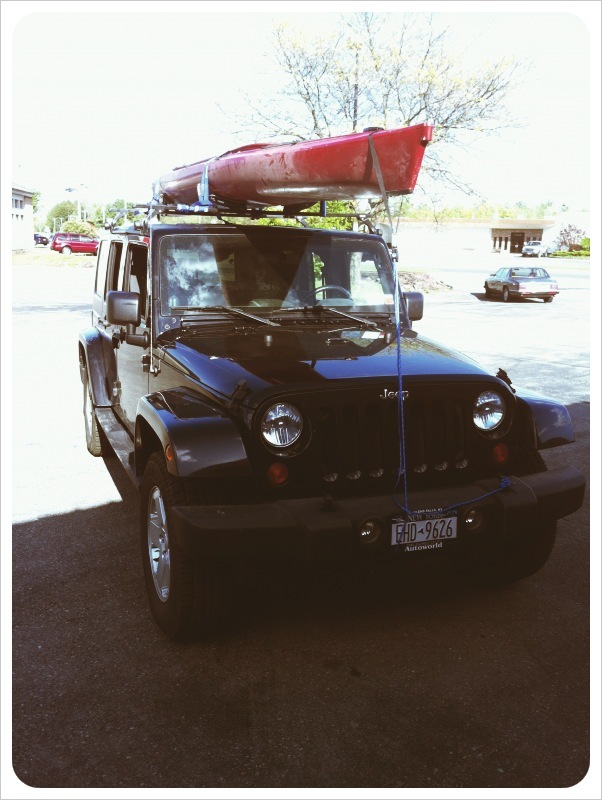 For a canoe, use the Jeep Patriot Canoe Carrier. For a kayak, use the Jeep Patriot Kayak Carrier. Although it seems crazy, and may look a little silly on the road, we have a friend who carries his canoe on top of his Jeep Compass, while taking fishing trips up in the Adirondack Mountains, so we know it can be done. He uses the Jeep Compass Sport Utility Bars by Mopar and the Jeep Compass Canoe Carrier. For Kayaks use the Jeep Kayak Carrier. There are also suitable options available from Thule, which in some cases are more expensive, but tend to be very high quality products. To carry your favorite vessel on your Jeep Grand Cherokee, it’s the same old story, use a set of the Grand Cherokee Sport Utility Bars and the Grand Cherokee Kayak Rack or Canoe Rack. If a Jeep Liberty is your vehicle of choice, get a set of the Liberty Sport Utility Bars and the Liberty Kayak or Canoe Rack by Mopar or Thule. For carrying your Kayak or Canoe on a Jeep Commander, you’ll need the Mopar Sport Utility Bars and the Jeep Commander Kayak or Canoe Racks. Or what the heck, just stuff your kayak inside that big boy! We’ve had a lot of interest recently on carrying your boats with your Wrangler as well. Unfortunately, we’ve yet to see a solution that wasn’t completely awkward and maybe even dangerous. We know of people who take the top off and use their Jeep’s roll bars and rig up some home made straps to transport their canoes. We also know people that will stuff their kayak into the rear of their Wrangler at an disastrous angle and hope for the best. We cannot recommend either method, particularly for long trips, but if you’re like us you’ll do what it takes to get your boat on the lake or river. 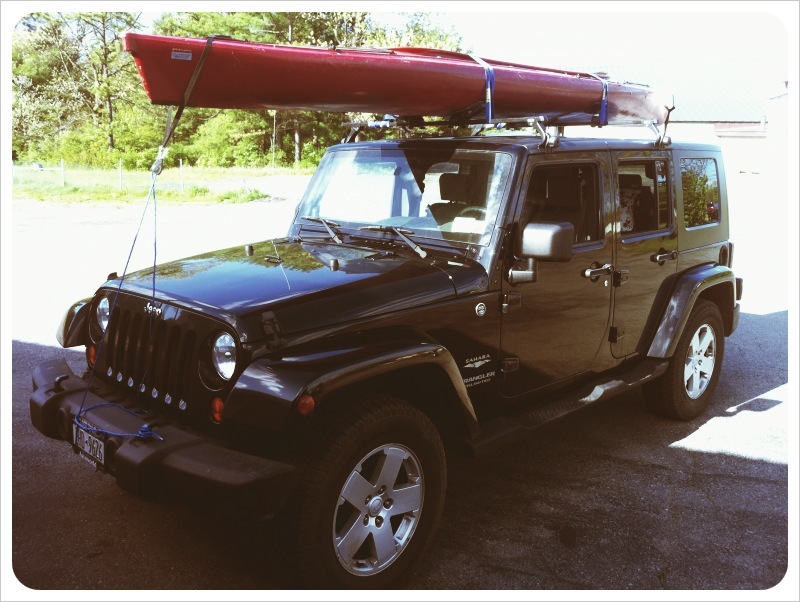 UPDATE (5.15.12) – A new solution for carrying a kayak on your Jeep Wrangler! You are currently browsing the archives for the How to: category.